November 2015 - Governor McAuliffe and Transportation Secretary Aubrey Layne recently announced two projects in partnership with Transurban that will bring significant benefits to anyone who travels on I-95 and I-395 in Northern Virginia. Extensions of the 95 Express Lanes are planned in both the north and south - providing our customers with even more time-savings and predictability. We thank our more than 2 million customers and are proud to host approximately 85,000 trips each day on the Express Lanes. As we did with the 495 and 95 Express Lanes, Transurban will work to deliver these improvements safely and as quickly as possible. A project factsheet on the 95 southern extension can be found at https://www.expresslanes.com/feature/1831 and additional information about the 395 Express Lanes is available at www.395expresslanes.com. For sluggers, and the drivers who pick up slugs, traveling on the 95 Express Lanes will be easy – all you need is an E-ZPass® FlexSM. With three people in the vehicle and an E-ZPass Flex set to HOV mode, sluggers travel toll-free on the 95 Express Lanes all the time. 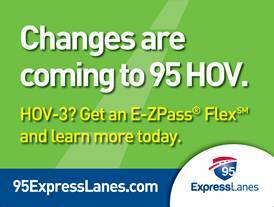 The 95 Express Lanes will end just after Edsall Road in Fairfax County. The HOV lanes north of this point will remain HOV only, a continued incentive to slug into Arlington and Washington, D.C.Here's what you need to know to prepare for the 95 Express Lanes. Vehicles that do not meet the HOV requirement when the HOV rules are in effect will need to exit from the Express Lanes and reenter the regular I-395 lanes after Edsall Road to continue into Arlington and Washington, D.C.
Be sure to get an E-ZPass Flex so you can continue to slug – available at AAA Mid-Atlantic, select Giant and Wegmans locations in Northern Virginia, at Tysons Corner Center, online and at E-ZPass customer service centers. Already have a standard E-ZPass? If you want to carpool/slug on the Express Lanes, add an E-ZPass Flex as an additional transponder on your account, or exchange your existing standard E-ZPass for an E-ZPass Flex.